Nutella can be a wonderful little spread. You can spread it on bread, be used in crepes, or just eat it straight from the jar. But that’s only half of the fun. Nutella is wonderful for baking. There’s so many recipes for everything Nutella that you might never get bored of it. Lately, I’ve been trying all kinds of crepes. I found this one crepe place close by, and they have a large display of Nutella jars near their kitchen. Now you know they use Nutella pretty frequently if you see how many jars they have. T- and I got together to bake these little gems. We wanted to make something with hazelnuts, and we landed on Nutella cookies. 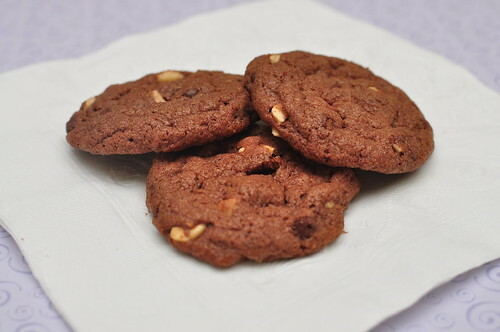 These cookies were very easy to make, but they taste so expensive because they have hazelnuts :). Bake them and take them to someone you want to impress. These do not fail. Preheat oven to 350F. Cream butter in an electric mixer for 3 minutes until light and fluffy. Add the sugars and Nutella and mix well, scraping down the sides of the bowl to ensure even mixing. Spoon tablespoon-sized drops of dough onto parchment paper lined cookie sheets. Bake at 350F for 10-12 minutes. Allow to cool on the sheets for a minute or two before transferring to a wire rack to finish cooling. This entry was posted in Cookies, Recipes and tagged chocolate, cookies, hazelnuts, nutella on November 16, 2011 by Krystal.